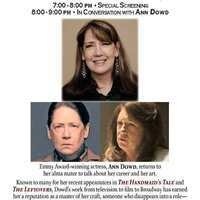 Emmy Award-winning actress, Ann Dowd, returns to her alma mater to talk about her career and her art. Known to many for her recent appearances in The Handmaid’s Tale and The Leftovers, Dowd’s work from television to film to Broadway has earned her a reputation as a master of her craft, someone who disappears into a role—large or small—and inhabits that character with such skill and ease that “acting” doesn’t even seem like the right verb. Come celebrate the illustrious career and incomparable talent of Ann Dowd as the DHC screens some of her work and invites her into conversation in an evening dedicated to exploring the craft of acting and the far-reaching import of her art.